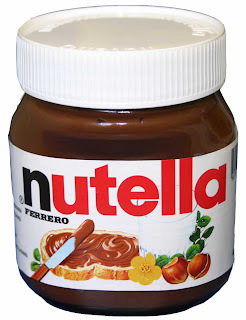 Eat Halal: Nutella Hazelnut Spread - Halal or Haram?? ingredients: sugar, modified palm oil, hazelnuts, cocoa, skim milk, reduced minerals whey (from milk), soy lecithin: an emulsifier, vanillin: an artificial flavor. I just received an Email from Nutella (canada) confirming they whey in their ingredients is not from any animal source but rather from vegetarian source.According to the consumer affairs spokesperson they have contacted their suppliers and have been told that the rennet is free from animal products / by products. Thank you for contacting Ferrero Canada regarding NUTELLA®. We have confirmed with our Product Development team that NUTELLA® 400g and 750 g manufactured by our plant in Brantford for Canada is produced with “vegetarian” whey since modern cheese and whey production does not include animal bi- product. NUTELLA® is OU Kosher certified. p.s: As always please check with the company (nutella) YOURSELF and try to get it all in writing.. and also another general rule is to keep updating every few months or so whether their ingredients have changed our not..
oh that answers a lot of my questions...but wut about the vanilla thing? do they put any type of alcohol? The Nutella manufactured and imported into the UK is not suitable for vegetarians. Ferrero are currently in the process of changing all our Nutella using the vegetarian sourced whey powder, however, France where the UK Nutella is produced is still to be converted. I can confirm that Ferrero Rocher is suitable for vegetarians and the whey powder is used is vegetarian sourced. Thank you for your quick response to my querry. One of my friend has sent me your Australia web site which approves that Nutella was halal in 2008, I am not sure now. Also another American website has a competition about Nutella recipes which made me think that the one they consume also must be halal because the website called myhalalkitchen. If you are able to give me that information, could you please let me know what countries which Nutella was produced, suitable for halal or vegetarian diet? Also another request to whom it may concern, Why they don't think of potential consumers who would love to buy Nutella in UK if it was halal or at least suitable for vegetarian diet as we need to find alternatives instead? If Nutella is not suitable for vegetarian diet, your other product Ferrero Rocher is not suitable as well, or is it edible for vegetarians? Thank you very much for your time answering my questions. Thank you for your email regarding Nutella. I can confirm that Nutella is not suitable for vegetarians and therefore not suitable for halal. I have heard that Nutella which you are producing-selling in UK is not suitable for vegetarian diet. A friend said that Nutella has HALAL certificate. Could you please also confirm that whether Nutella is HALAL or not? Notice: The information contained in this e-mail and/or documents which accompany it is confidential, may be privileged, proprietary and exempt from disclosure, and is intended for the exclusive use of the person or persons to whom it is addressed. If you are not the intended recipient or if you have received this message in error for any reason, please advise us immediately by reply e-mail and delete both the message and the copy thereof contained in reply. Thank you. We would like to thank you for taking the time to contact us with your question regarding our products. Nutella & Rocher do not contain alcohol or animal by products. They whey is derived from milk but demineralized to filter out raw whey mixture. We are dedicated to providing consumers with the highest quality products to enjoy and are grateful for loyal consumers like you. We hope that you will continue to enjoy our Nutella® hazelnut spread as well as our other excellent products. Subject: Nutrition/Ingredient Information - Nutella"
I think it depends on what country you live in, here in Australia Kit kats have alcohol in them!